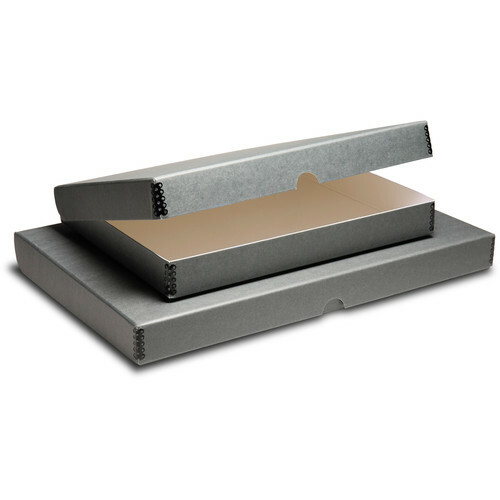 The black 22 x 30" Print File Clamshell Metal Edge Box > is used by photographers, artist, and archivist for storing and protecting photographs, flat art, and other documents from outside contamination. The exterior and interior of the clamshell box is made from 60pt. boxboard with black metal edges for added strength and durability and for stacking the boxes on top of each other. The lid has a thumb cut for easy access of the stored contents, and the clamshell box is suitable for long-term storage because it has passed PAT testing. Box Dimensions (LxWxH) 30.5 x 22.5 x 2.0"